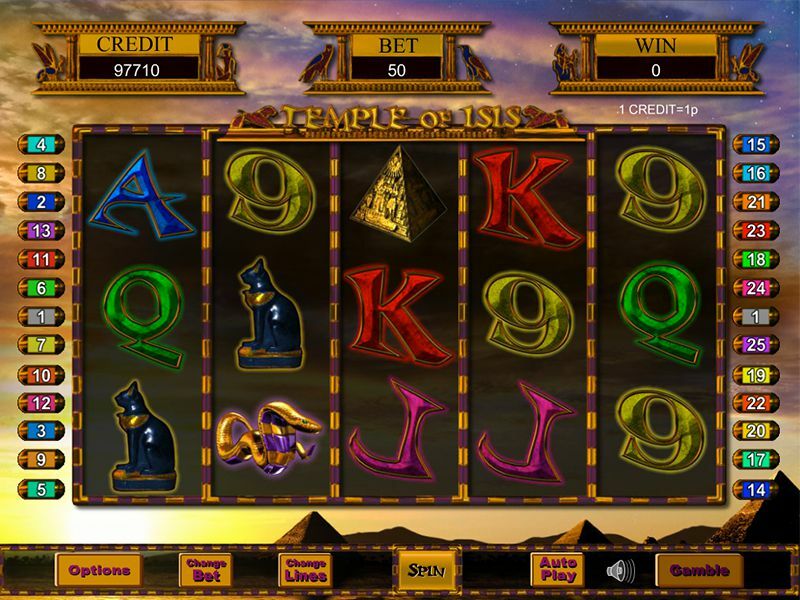 Embark on a quest into the ancient Egyptian 5 reel slots world and uncover the hidden Temple of Isis. 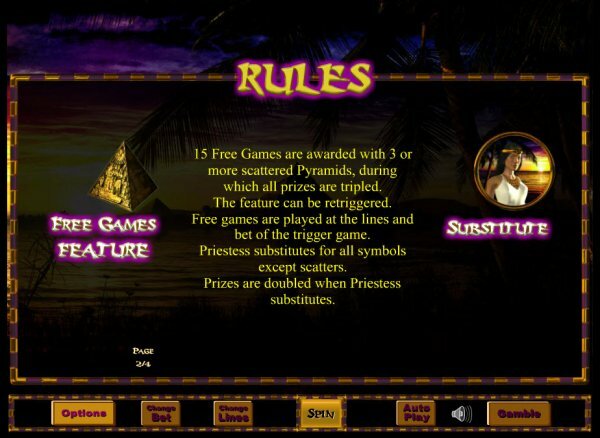 Pull on your boots and take a journey underground into the sandy tombs of the pyramids and uncover huge multiplier and free spin bonuses in this ominous online slot game. Eyecon is a games development company founded in 1997, whose most successful game received millions of downloads. The company became interested in creating online casino games and in 1999, they began to build their own online casino system and gambling games. 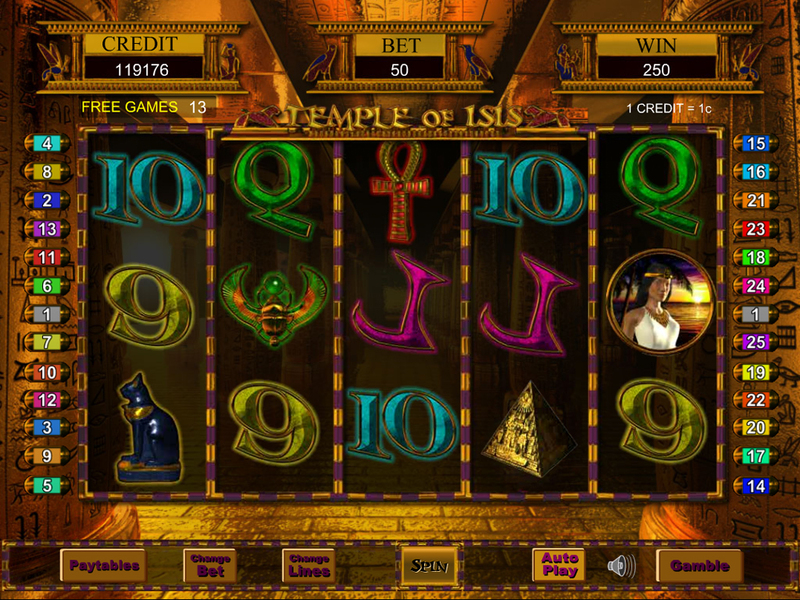 Temple Of Isis was their first ever slots game, created in 2003. Eyecon pride themselves on creating timeless games that keep bringing in players year after year. Their most successful game to date is Fluffy Favourites, which was released in 2006. You can read more about Eyecon's range of game son Easy Slots online casino here. 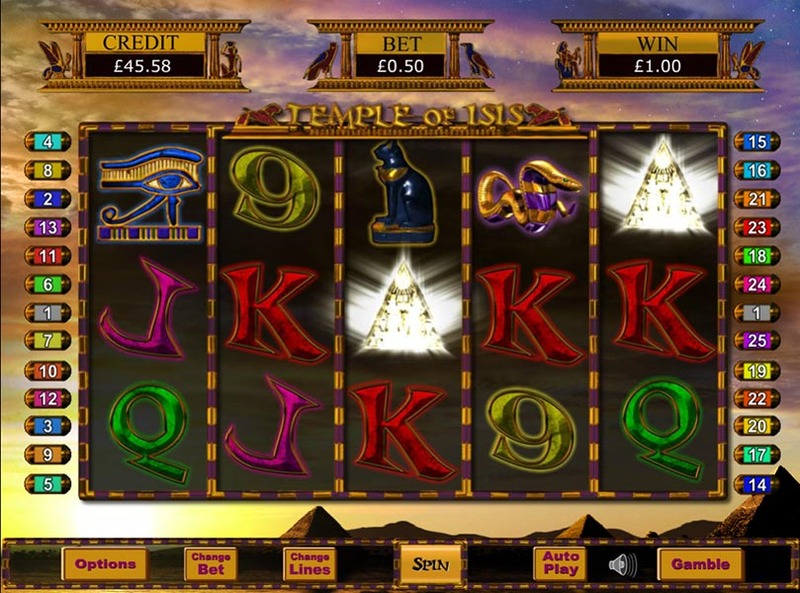 Temple of Isis is an ancient Egyptian themed 5 reel online slots game with 25 pay lines, available to play on desktop, mobile and tablet. The story of the game is based on the story of the Egyptian god of Earth and Goddess of the Sky. The game's backdrop is simple, consisting of a desert with pyramids. The symbols in the game are fairly average, consisting of the usual A to 9 symbols representing the lower values, and 6 unique Egyptian themed objects to represent the higher values. The Ankh Cross a Cat God symbols both awards the player up to 10 times their original stake per pay line, along with Apep the snake god, who awards up to 18 times your original stake per pay line. On top of these, are the Eye of Horus and Scarab Beetle, both of which pay up to 38 times your original stake per pay line. The Wild Symbol in this game is the Egyptian priestess and it can replace any and all symbols excluding the scatter. This is by far the most valuable symbol in the game, as when the Wild Symbol appears anywhere on the reels, the total payout is doubled. This means that if you land 5 of them, you can get 380 times your total stake. The game's Scatter Symbol is the pyramid. If the player lands 3, 4 or 5 of this type of symbol, they will win 5, 20 or 450 times their total stake. If these conditions are met, the player will also trigger the free game feature, along with 15 free spins. Any winnings gained during the Free Game feature are multiplied by 3. It is possible to retrigger the free game feature up to 15 times, giving up to 240 free spins in a row. 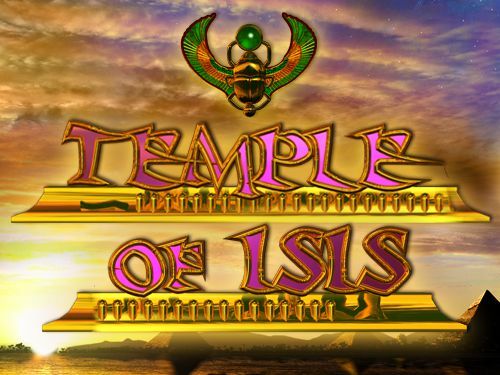 Temple of Isis is an addictive slots game with a unique take on the “Wilds” function. The game is addictive and easy to pick up, but as far as Eyecon’s usual standard, it is below par. The lack of their signature pick ‘em rounds found in a lot of their slots games is a disappointment, but the 3x multipliers and double wilds are pretty entertaining. The fact that it is possible to win up to 1,350 times your wager on each free spin is something I personally find difficult to comprehend due to the fact that if a player bets the maximum of £12.50 and managed to trigger this, they would win £16,875 from that single spin.